We regard the District Court ruling of February 2015 that AXP’s “no-steering” rules are unlawful as a watershed event for the US payments industry; if upheld on appeal this year, it will lead to more aggressive merchant-steering between network brands and products particularly as consumer payments migrate to merchant apps. This, in turn, will drive down merchant fees as networks compete for merchant share of volume by lowering interchange (just as they have competed for issuer share of volume by raising interchange ~20% since the removal of the exclusionary rules in 2003) and by moderating, if not reversing, increases in network fees which have contributed 3-4% to annual revenue growth at V and MA since 2008 – see Chart. The AXP rules restrict steering on all network brands, not just the Amex brand. In response to the likely removal of the rules, DFS has said that it will “aggressively pursue a strategy of lower [merchant] prices”, Hilton Hotels has explored arrangements where it will receive higher interchange rebates in return for directing a greater share of charge-volume to Visa, and AXP has plans to provide financial incentives to “anchor merchants” who can ensure brand-relevance in their industry by designating Amex as a preferred card. Except in the card business, steering between vendor brands and to private-label alternatives is a mainstay of retailing as evidenced by the ~$200bn spent annually on trade promotion (versus $60bn available as interchange for banks to fund card rewards). In card, while retailers steer to private-label solutions (as in the Target RED program which offers a 5% discount on all purchases), they typically do not otherwise steer, through price-discrimination or otherwise, between the network brands or from credit cards to lower-cost tenders. Notable exceptions are discounts for cash (e.g. at gas stations) permitted under the Cash Discount Act of 1981 and the default-prompting for PINs for debit transactions by the point-of-sale debit installed at most of the large US retailers. This limited merchant steering is despite: (i) the increasing use of credit cards by consumers who are motivated by bank rewards programs rather than a need for pre-approved credit at point-of-sale; (ii) the regulation of debit interchange in October 2011 (which lowered the average rate on a regulated transaction to ~25 cents versus 1.5% or more of value on a credit transaction); (iii) the relaxation of Visa/MasterCard rules so as to allow discounts for debit cards in July 2011 and surcharges for credit cards in January 2013; and (iv) the effectiveness of steering in Australia (where surcharges on credit cards were permitted in 2003 and where, by 2010, ~30% of merchants had adopted them) and in the US in the early 1990s (when the “we prefer Visa” contributed to a 25%+ shift in card volume from AXP to Visa). The consensus call that merchant steering will remain limited is likely mistaken for two reasons. The first is that AXP did not participate in the Visa/MasterCard settlement allowing surcharges on credit cards so that Amex-accepting merchants, including most of the large US retailers, remain bound by restrictive anti-steering rules which will be removed if the District Court ruling of 2015 is upheld on appeal. The second is that the migration of consumer payments to merchant apps meaningfully improves the payoff to merchant steering by reducing the risk of a lost sale if a merchant does not accept the preferred tender of a customer. This is because merchant apps will engage consumers through benefits that, for some segments, can outweigh bank-level rewards including the earn-and-burn of loyalty points and coupons, searchable archiving of receipts (to support credits for returned items, for example), and a path-to-purchase that combines the convenience of a digital experience with the immediacy of an in-store experience. The networks are responding to the fee risk from increased merchant steering by acting as token service-providers and so furnishing the tokens that help make app-based payments secure whether the tender is network-branded or otherwise (with MasterCard tokens, for example, supporting the private-label card programs of SYF, ADS, or C). The related risk to merchants is that Visa and MasterCard reduce the economic benefit from steering by porting their near-duopoly over the primary account numbers or PANs that appear on the front of network-branded plastic cards to a near-duopoly of the “tokens” which perform a similar function to PANs (acting as a proxy for the credentials of the ultimate funding account) in app-based payments. It follows that the strategic importance of PYPL is in offering merchants an alternative token solution. The “no-steering” rules, barring Amex-accepting merchants from expressing a preference to their customers about which card brands to use, limits any offsetting pressure from merchants on the networks to reduce interchange fees. As the District Court notes, the no-steering rules “sever the essential link between the price and sales of network services by denying merchants the opportunity to influence their customers’ payment decisions”. Once the rules are removed, we expect networks to offer more aggressive pricing to merchants in return for merchant-preferencing at point-of-sale. Indeed, DFS has said that it will “aggressively pursue a strategy of lower [merchant] prices”, Hilton Hotels has explored arrangements where it will receive higher interchange rebates in return for directing a greater share of charge-volume to Visa, and AXP has plans to provide financial incentives to “anchor merchants” who can ensure brand-relevance in their industry by designating Amex as a preferred card. There is skepticism around whether steering efforts will prove effective among investors who cite the examples of Australia which removed credit card no-surcharge rules in 2003 and of the US which removed credit card no-surcharge rules in 2013 and increased the merchant incentive to steer from credit to debit in 2011 by regulating debit interchange at a meaningfully lower level (~25 cents/transaction) than credit interchange (which averages ~1.5% of transaction value for a no-rewards card and over 2% for a high-rewards card). As discussed below, the evidence from these examples is ambiguous and, in any event, will become less relevant as consumer payments migrate to mobile devices and, in particular, are integrated into merchant apps as in the case of, say, Walmart Pay and CurrentC. In environments where consumers using “high-end rewards” credits cards generate a benefit that is not available to consumers using alternative low- or no-reward tender and paying the same price at point-of-sale, the rewards are a free good and help to explain the increasing share of credit cards in the US payments system as measured by purchase volumes. These share gains are, of course, a strategic priority for the networks which have historically prevented merchants from imposing a cost on users of their cards through the “no-steering” rules (preventing a merchant from expressing a preference for a card of another brand) and the “no-surcharge” rules (preventing a merchant from imposing a surcharge on customers using a branded payment card). For example, in the US until July 2011, merchants were not permitted under network rules to create a disincentive to consumer use of card brands, or express a preference for one card brand or product over another, including through offering discounts or imposing surcharges. An exception is that, under the Cash Discount Act of 1981, merchants are permitted to offer discounts for cash purchases as many gas stations do. In July 2011, under a settlement between the DOJ and Visa/MasterCard, the ability to offer discounts was extended from cash so that merchants can offer discounts for using a particular credit card network and for using alternative tenders including debit cards (so that Ikea, for example, offered a return-purchase incentive in the form of a 1% coupon to customers paying with debit). Finally, in January 2013 following a further settlement with the DoJ, the Visa and MasterCard networks (but not Amex) allowed merchants to price-discriminate against credit (but not debit) cards and between brands through surcharges up to the amount of the merchant discount fee and subject to an overall cap of 4% of transaction value (although merchants remain constrained by no-surcharge laws in eleven States). In Australia, no-surcharge rules on credit cards were removed in 2003 and so provide a test-case on the possible impact on merchants for the later removal in the US in 2013. 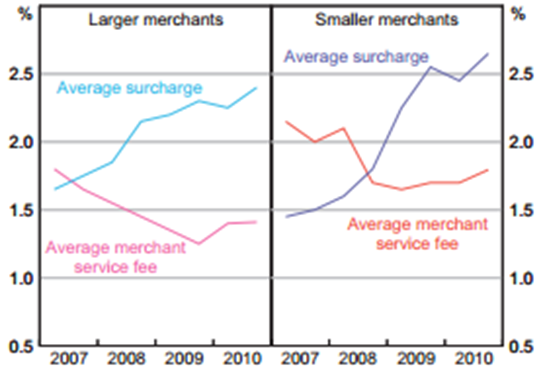 While the initial effect in Australia was limited, as it has been in the US, the Reserve Bank of Australia reported that by December 2010 ~30% of merchants applied a surcharge, ranging from 1.8-4% of transaction value, on at least one of the credit cards they accepted and that this form of steering was effective in shaping payment preferences with 40% of consumers indicating they would complete a transaction with the payment card attracting the lower surcharge and merchants able to lower their average fees by imposing surcharges (Chart 2). So far in the US merchants have not typically offered discounts on debit cards or imposed surcharges on credit cards despite the gap that opened between credit and debit interchange rates following the regulation of the latter in 2011, survey-evidence that consumer choice of tender responds to price-signals (Chart 3), and merchant belief in the likely effectiveness of price-discrimination. Kroger, for example, commented that “through discounted payments on electronic payments, we can begin to inform our customers and also drive our customers to using more efficient and lower-cost products.” As discussed below, we believe the migration of consumer payments to merchant apps will catalyze more aggressive merchant steering. Of course, retail price discrimination whether through surcharges for credit cards or discounts for lower-cost tender such as cash and debit is a particularly blunt form of steering, and there are other approaches. For example, some large US retailers have long preferenced PIN-formatted debit (where a customer authenticates at point-of-sale by entering a personal identification number onto a PIN pad as in an ATM transaction) over signature-authenticated debit (where a customer authenticates at point-of-sale by providing a signature as in a credit card transaction) by installing point-of-sale devices which prompt for a PIN by default. However, with some exceptions including private-label, the fact remains that US merchants have not used retail price-discrimination to shape consumer choice of network brand or product at point-of-sale. We believe this will change with the consumer migration to mobile payments and, in particular, the integration of payments capability into merchant apps. The economic underpinnings of merchant propensity to steer between card brands are straightforward: merchants must balance paying supra-competitive fees against the risk of lost sales for refusing the preferred tender of a customer. This calculus lies behind an aphorism from the early 2000s of AXP CEO Ken Chenault that “an insistent cardholder is a profitable cardholder”. This brings us to our core thesis: that the migration of consumer payments from cards, regardless of form factor (i.e. whether presented in plastic or via an iOS or Android), to merchant apps meaningfully reduces the risk to a merchant of lost sales from tender-preferencing. The reason is that the merchant apps will integrate payments into important consumer benefits including the earn-and-burn of loyalty rewards and coupons, searchable archiving of receipts (to support credits for returned items, for example), and a path-to-purchase that combines the convenience of a digital experience with the immediacy of an in-store experience; these benefits will help habituate consumers around the use of merchant apps for commerce, including payment, and hence reduce the risk of lost sales from merchant-preferencing of particular payment-tenders or brands within an app. The networks are looking to respond to the fee risk from increased merchant steering by acting as token service-providers and so furnishing the tokens that help make app-based payments secure whether the tender is network-branded or otherwise (with MasterCard tokens, for example, supporting the private-label card programs of SYF, ADS, or C). 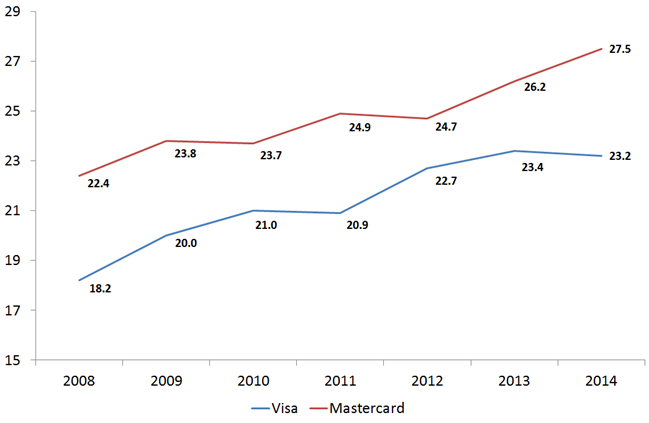 The risk to merchants is that Visa and MasterCard succeed in reducing the economic benefit from steering by porting their near-duopoly over the primary account numbers or PANs that appear on the front of their plastic to a near-duopoly of the “tokens” which perform a similar function (acting as a proxy for the credentials of the ultimate funding account) in app-based payments. The strategic significance of PYPL to merchants as they look to break the network duopoly is that it offers merchants an alternative token solution.